Tapsilog is the perfect breakfast for me. 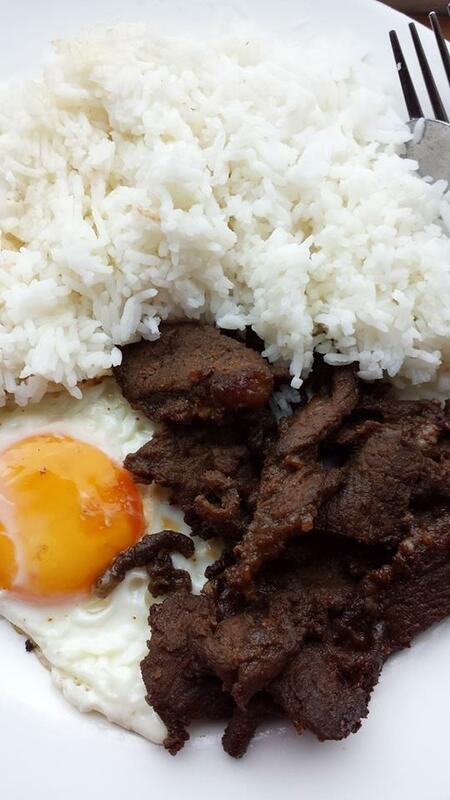 I love ♥ the fried cured beef strips( tapa), fried rice(sinangag) and fried egg(itlog) combination ☺. 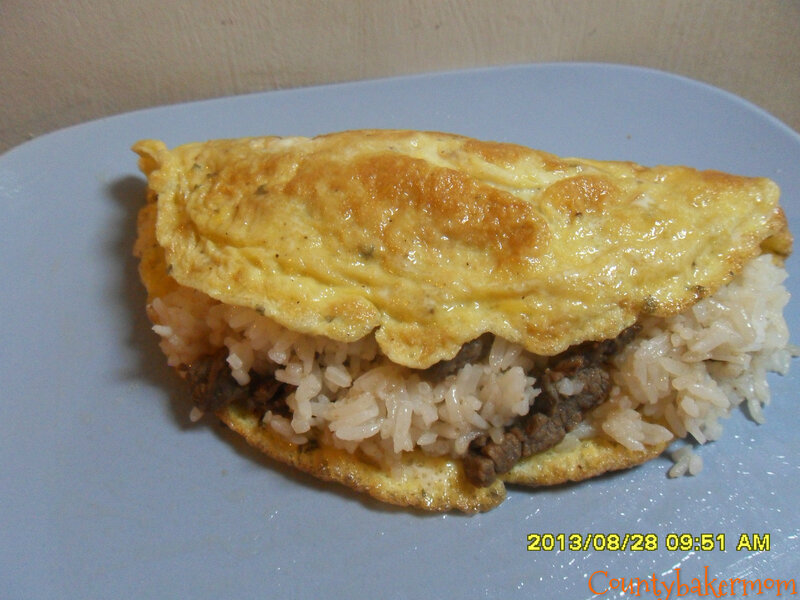 Tapsilog is also popular in my country Philippines and I must say one of the staple food of all Filipinos. 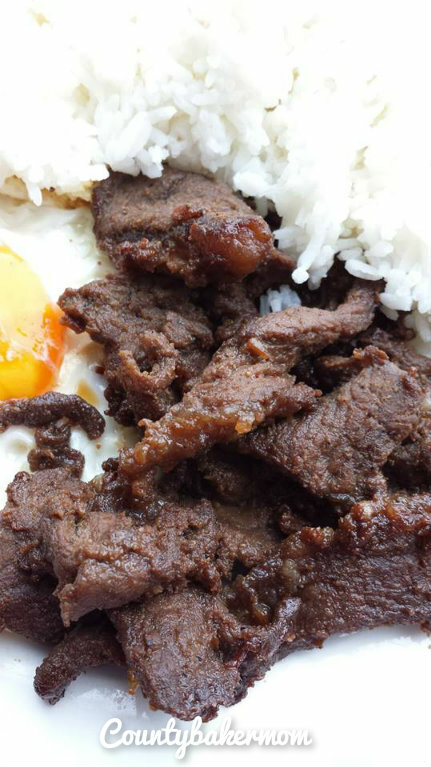 The tapa is usually made by marinating the beef in a special sauce or mixture and then drying it out in the sun. This process gives it that sweet, savory flavor and slightly chewy texture. Of course I skip the drying process since it is not that sunny here but I assure you that it still like the tapa that you’ve craved. 1. Put the soy sauce, vinegar, minced garlic, sugar, salt and pepper in a bowl or in a freezer bag. Mix it well. 2. Add meat. Let it marinate overnight, or at least 1 hr. 3. When done marinating, drain then fry the meat in a pan, with 2 Tbsp cooking oil, over medium low heat just until cooked through (or if you want, until crispy). Put 5-6 strips per plate. Set aside. 4. Make garlic fried rice in the same pan . Saute the garlic until golden brown. Add the rice. Break it down and mix it well, so the oil gets on all the rice. Add salt to suit your taste. Fill a cup with rice. Put cup upside down on the plate beside the beef strips then lift. 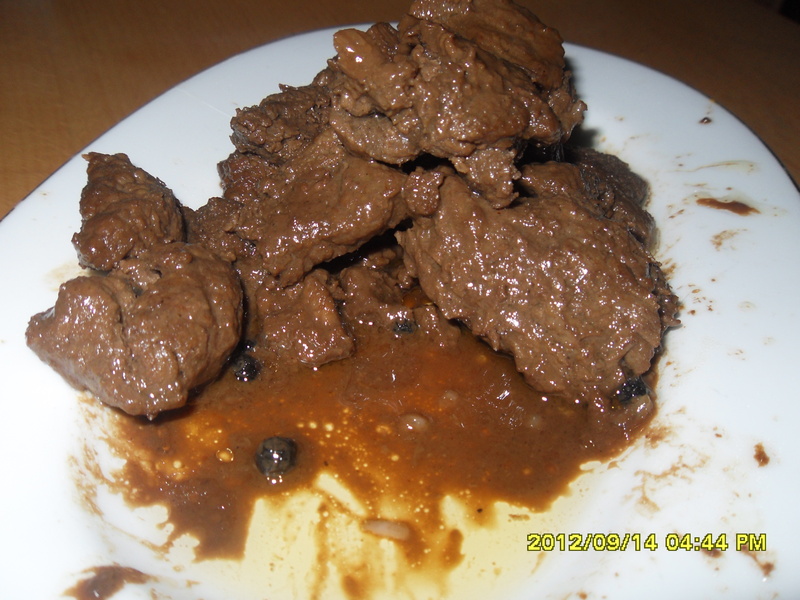 I didn’t know why it’s called beef pares until I searched for this recipe. Pares literally means “pair” in English. As this dish is best eaten with a pair of garlic fried rice and beef soup. Another sure hit to my taste buds and to my family too. 1. Place the beef in a big sauce pan . Add enough water to cover the meat (about 2L) and bring to a boil over medium low heat until scum appears on the surface. Clear the scum off the broth. 2. Add all the soup ingredients except the green onions for garnishing. Add salt to taste. Cover the saucepan. Adjust heat to low and simmer for 1 to 2 hours or until the beef is tender. 3. When the meat is tender, remove from the sauce pan and allow to cool down. 4. Meanwhile, transfer the broth to another sauce pan , leaving about 2 cups of it in the original sauce pan. The broth in the new sauce pan will be the soup. Simmer over low heat until ready to serve. 5. Slice the beef in cubes and return to original sauce pan. 6. Add the soy sauce, sugar, bay leaf, star anise, ginger, and black pepper. Season with salt to suit your taste. 7. Bring to a boil and simmer over low heat until the sauce thickens that is about 15-20 minutes. 8. Serve with garlic fried rice and the reserved beef soup. 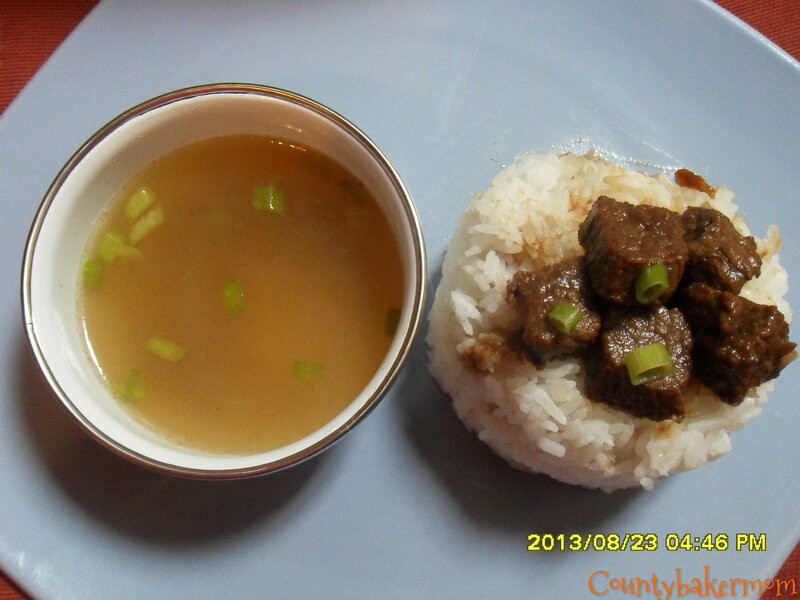 Garnish beef stew and soup with chopped green onions. I am back! I don’t know but lately I am not in the mood to write 😦 . I am getting lazier as the weather gets colder, brr!!! Anyway, I am here to share the recipe that I just cooked recently. 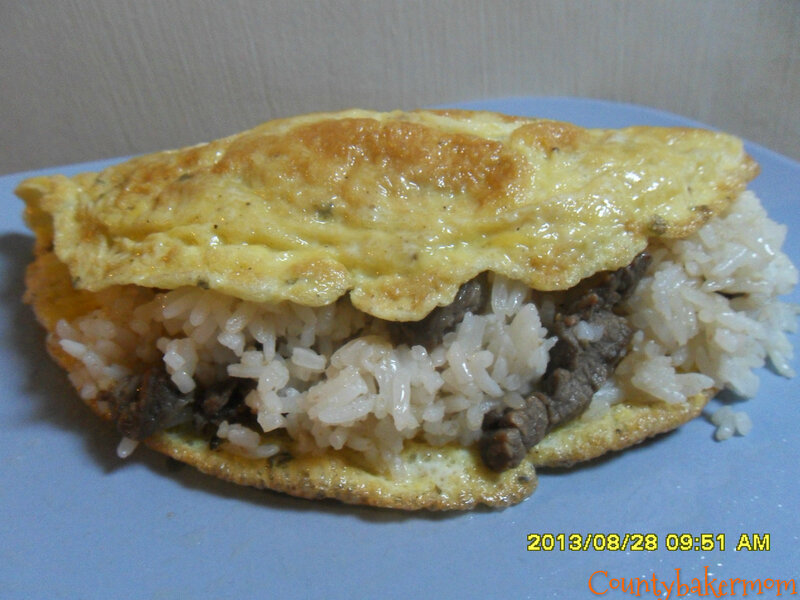 It was different from the usual beef steak that is only marinated with soy sauce & lemon juice. I find this recipe as more tasty and yummy, my husband loves it actually. I got the recipe from The Peach Kitchen . I didn’t put mine with pineapple tidbits as I don’t have it . In a large bowl, combine pineapple juice, soy sauce, calamansi juice and pepper. Mix well. 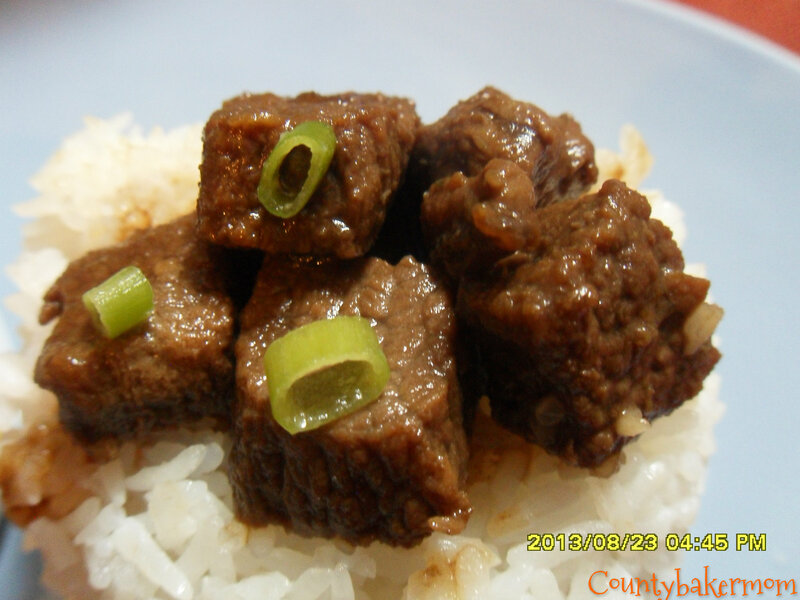 Marinate beef in the mixture for at least 1 hour. In a non-stick pan, heat oil. Sauté onion slices until it’s a little bit caramelized. Set aside. In the same pan, fry beef strips until light brown. Add marinade and simmer for 10 minutes in very low heat.